Summer may still be a few months away, but the Inn at the Chesapeake Bay Beach Club in Stevensville, Maryland is already primed for another spectacular season. Opened in 2015, and part of the Southern Living Hotel Collection, the Inn has become one of the premiere hotel destinations on Maryland’s Eastern Shore. Coakley & Willams Construction, Inc., of Bethesda, Maryland, provided preconstruction and construction services for this state-of-the-art, 52,000 square foot hotel located near Terrapin Beach Park. 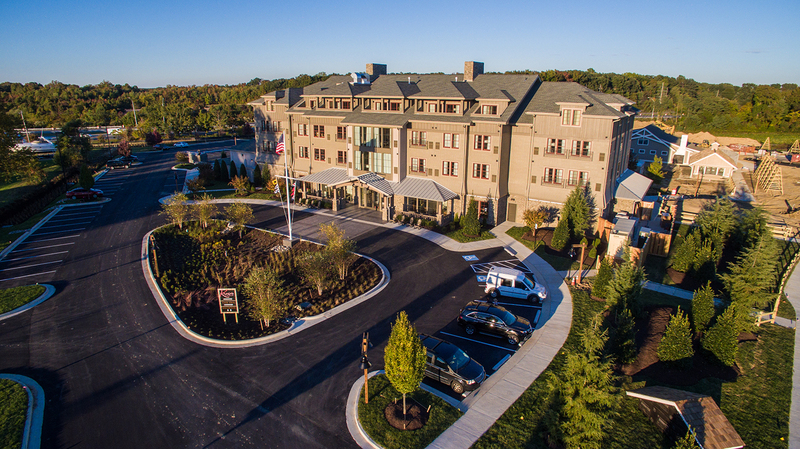 The 4-star Inn at the Chesapeake Bay Beach Club includes 54 guest rooms, two dining facilities, a banquet hall, offices, conference rooms, boardrooms, and back-of-the-house spaces, such as laundry rooms, break rooms, housekeeping, and a state-of-the-art kitchen. The casual-chic décor designed for the property, including the marketplace and the restaurants, utilizes exposed timbers, stone tile, and rustic wood flooring. The finishes are authentic regional materials with elegant accents, custom lighting and millwork, art and accessories. The first floor houses a lobby and two dining facilities: Knoxie’s Table, a 150-seat restaurant and bar with rustic décor, table and booth seating options, custom barrel light fixtures and a garden terrace; and the Decanter Room, a private dining space accommodating up to 16 guests. Other amenities include a gourmet grocery and café, a new banquet hall, offices, conference rooms, boardrooms, andback-of-the-house spaces such as laundry rooms, break rooms, housekeeping, and a state-of-the-art kitchen. The Inn’s more than 6,000 square feet of event space includes The Ballroom and a private tented courtyard featuring rustic architecture and accommodating up to 130 guests; a boardroom decked with a custom-built wood table, leather chairs, and a stone hearth fireplace; Hassie’s Porch, a climate-controlled porch with floor-to-ceiling windows; and the 1,000 square foot Tool Shed Bar, a shaded porch with where guests can sit on rockers to while away their worries. Guests and visitors can relax and unwind on the four acres of grounds surrounding the inn. The property includes gardens, courtyards, fire pits, fountains, activity lawns, and greenhouses.